Historic Seattle presents a Benefit Concert for the Campaign to Restore Washington Hall. This evening affair features performances by four generations of the legendary Holden family, a dynasty of Seattle jazz and music, and special guests The Teaching featuring Evan Flory Barnes, Josh Rawlings, and Jeremy Jones. Proceeds from this concert will go to restoring this 106-year-old theater to its former glory. The concert will benefit the capital campaign to restore Washington Hall. With a new roof, seismic stabilization of the south wall, and funds to build an elevator secured, the final phase of the campaign requires raising $2.2 million by June 2014 to continue the renovation of the former Danish boarding house at the back of the building. These spaces, once homes to immigrants from all backgrounds, will become offices for Hidmo, 206 Zulu, and Voices Rising and other community organizations, classrooms and meeting rooms, a recording studio, and cafe. 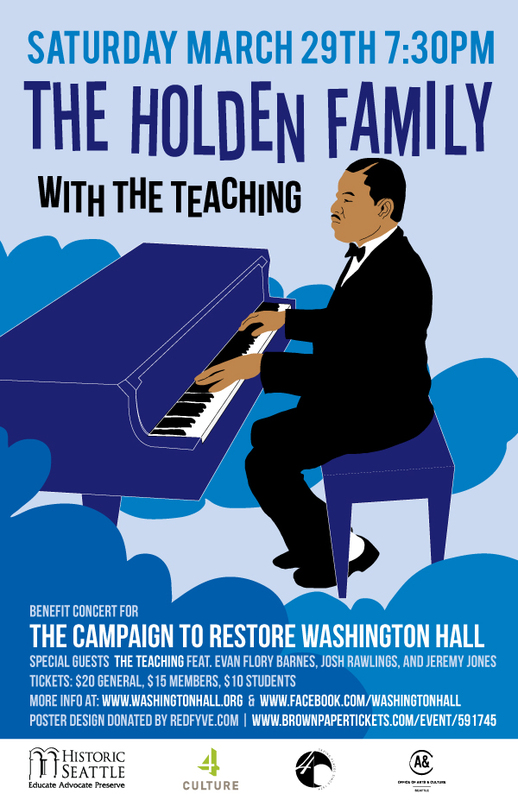 The Holden Family once lived across the street from the historic venue for more than 30 years, and four generations of Holden musicians will take the stage together for the first time in a public performance at Washington Hall, the site of the first jazz concert in Seattle. Patriarch Oscar Holden, who passed in 1969, was a pianist and played alongside Louis Armstrong and sat in with many of the touring musicians of the jazz era. Oscar Holden graces the cover of the Seattle jazz history, Jackson Street After Hours. Current patriarch David Holden, Sr., son of Oscar Holden, Sr., and a professional musician for more than 75 years, leads an ensemble of Holdens that spans four generations and many genres of music. The Teaching is made up of Seattle latest generation of jazz musicians, who blend tradition with hop hop, funk, and pop. As the unofficial studio band for Macklemore’s Grammy-winning album “The Heist,” Josh Rawlings (piano), Evan Flory Barnes (bass), and Jeremy Jones (drums) embody the musical legacy and future of Washington Hall. Historic Seattle owns and operates Washington Hall and the Good Shepherd Center in Wallingford. It believes that buildings provide an essential link to the past, reminding us of who we are and where we came from. Founded in 1974, Historic Seattle is the only nonprofit membership organization dedicated to preserving Seattle and King County’s architectural legacy. Our mission is to educate, advocate and preserve. Learn more about Historic Seattle.